This is one member of an ongoing series of Mandala designs. I couldn’t tell you when the series started let alone when it will end. I have found this to be a good fall back design concept for a certain category of client’s need such as Mother’s Day or Anniversary jewelry. What I mean is that this is a perfect vehicle for any type of design which requires multiple stones, often unusually different and conflicting colors. One terrific thing working in my advantage in this case is the fact that my parents had birthstones which were somewhat forgiving. Whenever you are designing a piece which requires birthstones, I feel that you should try as hard as possible to co-ordinate the colors. This is often simply not possible, example: Emerald (May), Ruby (July) and Pearl (June). Make that look good. Other months are friendlier because the birthstones have multiple colors, in which case a stone is said to be allochromatic. For instance September has Sapphire as it’s’ gemstone but there is nothing saying that it has to be blue. It could be yellow, purple or green, whatever the designer needs to fit within a color palette. 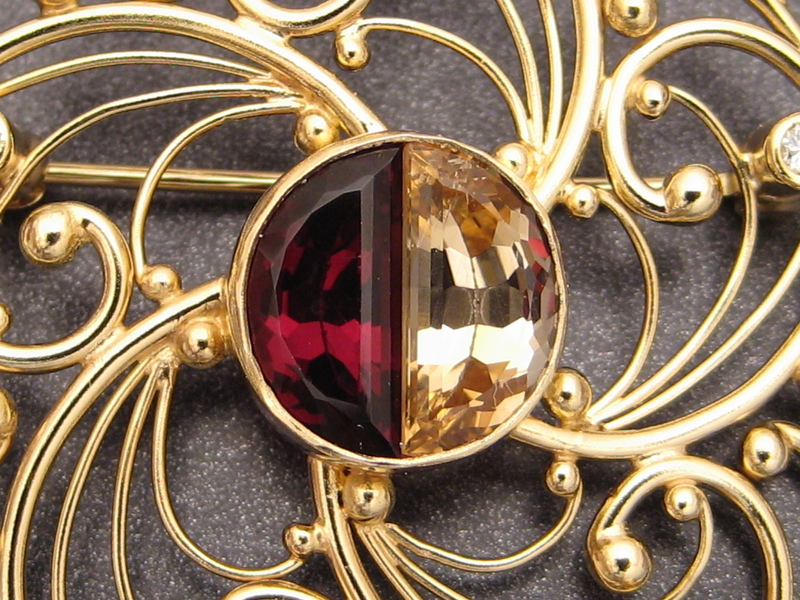 In this case the topaz could be golden yellow or blue and the garnet has many different colors. I had these stones custom cut by a faceter in Prescott named Ann Lamerson who cut them with an identical semi-round design so that both stones would fit within a round bezel. As I’ve written elsewhere I like to design with numbers. Even though you may have no understanding of what the numbers signify, hopefully they will stand out. 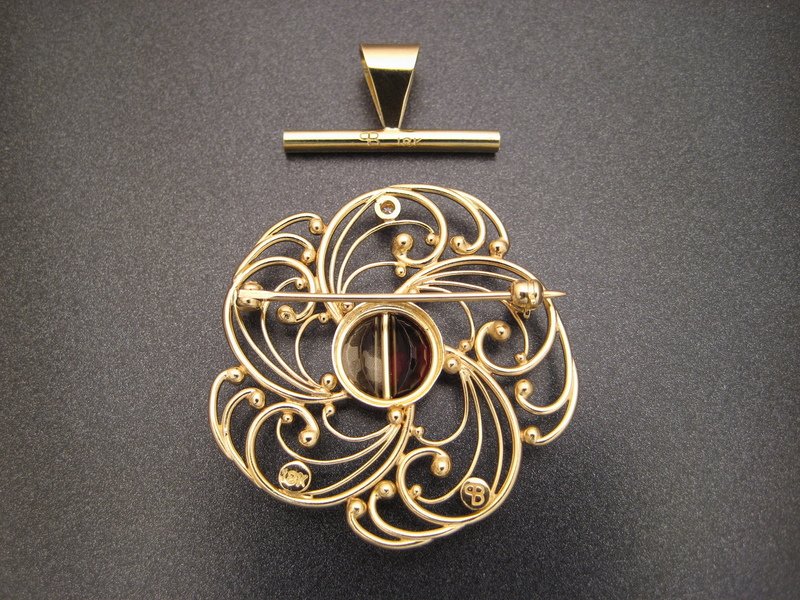 In this case, the pin/pendant was made to celebrate the fiftieth anniversary of my parents wedding. I laid out the mandala with five repeated segments to symbolize the five decades. Each segment was comprised of six gold wires to signify the six children who helped populate those decades and a single diamond within each just because. One unintended benefit of the choices we made with the gemstones was that they also matched the team colors of the ASU Sun Devils who my parents adored. 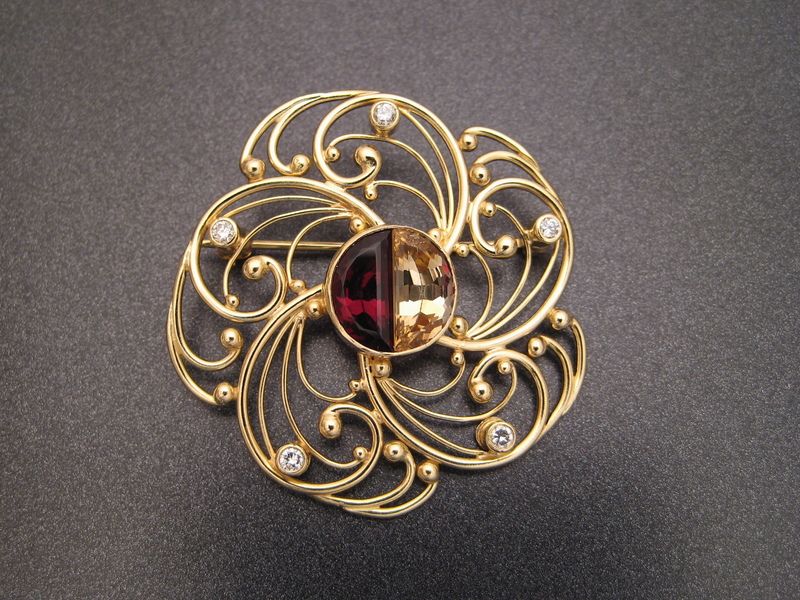 This piece is made from 18K Yellow gold and has a small removable bail which fits onto the pin stem so that it can convert from a pin to a pendant and back.